Fr. Leonir Chiarello, a Scalabrinian Missionary, is the Executive Director of SIMN and its Permanent Representative to the United Nations and other International Organizations. Prior to directing SIMN, Fr. Leonir worked in Latin America. From October 1996 to August 1997, he worked with migrant communities in Bahia Blanca, Argentina. From September 1997 to June 2006, he worked in Chile, as Counsel (1998-2001) and Executive Vice-President (2001- 2006) of the Episcopal Commission for Migrations of Chile (INCAMI). He was the founder and director of the Centro Integrado de Atencion al Migrante (CIAMI) of Santiago (2000), founder and first president of the Scalabrini Foundation and Scalabrini NGO of Chile (2003-2006), and Counselor of the Human Mobility Section of the Consejo Episcopal Latinoamericano – CELAM (2003-2006). For his commitment to at-risk Peruvian migrants in Chile, Fr. Chiarello received a Commendation Order of Merit for Distinguished Alan García Pérez, on July 12, 2007. Fr. 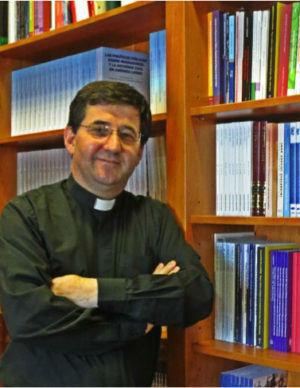 Leonir earned a bachelor’s degree in Philosophy at the University of Caxias do Sul, Brazil, a bachelor and master’s degree in Dogmatic Theology at the Pontifical Gregorian University of Rome, and a master’s degree in Social and Political Sciences at Alberto Hurtado University of Santiago, Chile.